TAIWAN: Dong Energy has opened its new office in Taipei, Taiwan, as it reveals an interest in developing four offshore projects. The office will be led by Dong Energy's Asia-Pacific general manager, Matthias Bausenwein. As part of the Taiwan's ministry of economics affairs offshore wind plan, which includes 36 proposed sites, Dong said it was carrying out environment impact assessments (EIAs) at four sites off Changhua County, west Taiwan. "Provided that the EIAs are approved by the Taiwanese government and subject to investment approvals by the company's board of directors, Dong intends to develop the sites into a total offshore wind capacity of at least 2GW and make a significant investment into Taiwan's energy infrastructure," the Danish developer said. Dong said it would explore opportunities in Taiwan, and the wider Asia-Pacific region, in April 2016. "Taiwan has a well established support regime," Dong CEP Henrik Poulsen told investors during a financial report webcast at the time. 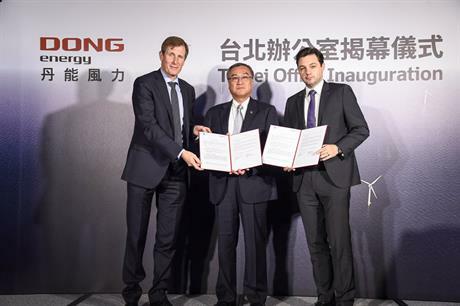 At the opening of the Taiwan offce, Bausenwein also announced the company had signed a letter on intent to partner with the Technology Research Institute to establish an "offshore wind ecosystem" in Taiwan to aid development of future projects.